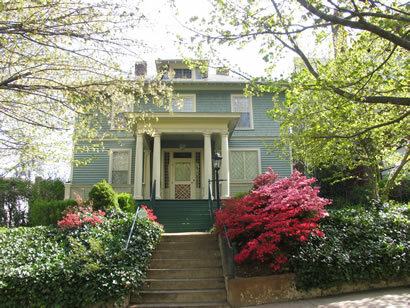 This Colonial Revival exterior flows with a Queen Anne interior. The house was built in 1908 by the architectural firm of Burnham and Lewis for James T. Carter. When the Carters moved in they brought their housekeeper, Aunt Melinda, who lived on the third floor. It is said that you sometimes can still hear her walk down the stairs and in the upstairs hall to check on the nursery and the Carter children.